DPA, 11th JUNE, 2018 - Ukraine and Russia are set to pave the way for a relaunch of conflict resolution talks in the German capital on Monday, with Germany and France serving as mediators. Pro-Russian rebels wanting to split from Kiev in the Russian-speaking majority east of the country have been in conflict with Ukrainian government forces since 2014. In an interview with Bild newspaper on Monday ahead of the meeting, German Foreign Minister Heiko Maas said he didn’t expect the revival of talks to be easy: “Ukraine and Russia’s interests and views lie far apart in many areas.” The talks are intended to be conducted among the foreign ministers of these four countries, Maas said on a recent visit to Ukraine. “We will not leave you alone when it comes to resolving the conflict here in the east,” Maas told his Ukrainian counterpart, Pavlo Klimkin, during his visit to Ukraine at the start of the month, which included a visit to the front line in the conflict. Maas said he hoped to negotiate a date for the start of peace talks by early July, including whether to send a UN-backed peacekeeping mission to Ukraine. 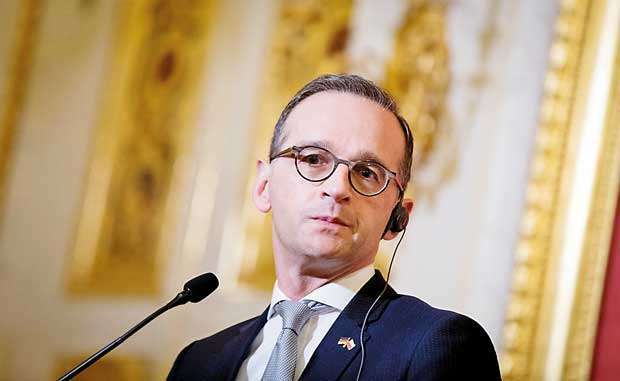 Maas said he would like to organize talks in the so-called Normandy format - including Russia, Ukraine, Germany and France - aimed at implementing a peace accord agreed in the Belarusian capital, Minsk, before the German parliament’s summer break, which begins July 6.